Mary's baby is kicking the light fantastic! Crown Prince Frederik and Crown Princess Mary with Prince Christian on his first day at nursery school with Christian's teacher Britta Just Petersen (far left) and the director of the centre Helle Zacho (next to Frederik). From Jyllands Posten/Bo Svane. The Sun-Herald/SMH has reported a story which might be a first for the Australian media: an interview with Prince Henrik. It is a combination of comments about Mary and a promotion of his wine, now being sold in the Australian market. French winemakers began a serious assault on the Australian wine market several years ago, a hard market to crack since Australia's wines are so good (ahem!). It was published in the Sunday version of The Sydney Morning Herald. Denmark's Crown Prince Frederik and Crown Princess Mary take Prince Christian to childcare for the first time. AS she prepares to become a mother for the second time, Princess Mary is leading the fight to protect her young subjects from the torment of bullies. Proving again that she is beloved of the Danish people, the anti-bullying program the princess introduced from Australia is being met with great success. Last week, when she and Crown Prince Frederik took 17-month-old Prince Christian to his first day of kindergarten, they carried with them a purple rucksack linked to the Save the Children program, the Danish equivalent of Tasmania's Better Buddies* program. Save the Children co-ordinator Lars Stilling Netteberg said the rucksack was an "obvious and personal endorsement" of Princess Mary's commitment. "We have had nothing but positive feedback from the pilot schools and we eventually hope to have it in every kindergarten and school in Denmark," he said. Blooming in a full-length brown coat, Princess Mary was all smiles as she arrived with her husband and son at the Queen Louise nursery, several kilometres from their palace at Fredensborg, 45 minutes outside the capital, Copenhagen. "Now he is ready for the nursery and it's well-timed because baby No. 2 is on the way," she said. The princess said the young prince, second in line to the Danish throne, had received no special favours. He had joined the local council waiting list alongside all the other local children for a place in a nursery. And, like his classmates, he took a packed lunch. "I went to a nursery as a baby and I think it's good for him to come out and be with other children of the same age," she said as she entered the nursery. Two hours later she emerged, looking relieved. "It was OK. He did it very well," she said of her little "Kingaroo". The princess's determination that her children should experience as normal a life as royalty will allow is one of the reasons she has won the hearts of the Danes and her in-laws. But her father-in-law, Prince Henrik, has revealed he and Queen Margrethe had qualms when their son, the heir to the Danish throne, told them he intended to marry an Australian. "We were nervous and inquisitive, like all parents. We talked to him and when we were convinced that it was as he wanted, we saw the lady, so we were convinced that it was a good choice also. There was no reason to worry. We are very glad to have such a charming daughter-in-law." Sitting with his favourite dachshund on his lap, the 72-year-old prince consort said he was delighted how Tasmanian-born Princess Mary had taken to royal life. "She has adapted herself very quickly and she has been accepted very quickly also by the Danish people because she is very charming. She learned the language very quickly. She speaks [it] perfectly and she is very loved in Denmark." Princess Mary's acceptance is in marked contrast to the reception the French diplomat received when he married Queen Margrethe in 1967. It is a subject he has since discussed with his daughter-in-law. They concluded it was easier for a girl to be accepted. As he awaits the arrival of his fourth grandchild - Prince Frederik's brother Prince Joachim has two young sons - Prince Henrik said: "We are so glad, the queen and I, with all our grandchildren. * Better Buddies is an Australia-wide project which is based in Melbourne (not Tasmania) through the Alannah and Madeline Foundation. Read the website here to understand the Tasmanian connection. DENMARK'S Prince Consort is joining the French winemakers who are targeting Australia in the international wine war. 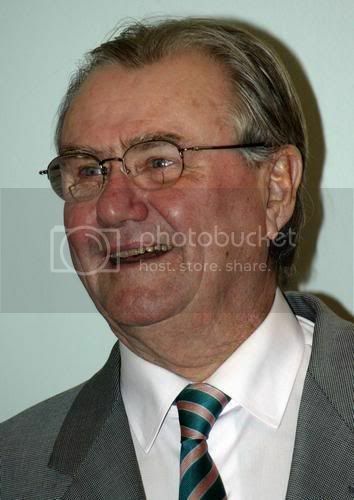 Prince Henrik, the 72-year-old husband of Queen Margrethe, hopes his links to Tasmanian-born Princess Mary will help. "It must be difficult to sell wine in Australia because you produce very good wines," he said at the royal palace in Copenhagen. "Perhaps the fact it is a royal wine and my daughter-in-law is from Australia will make it some good news." Prince Henrik owns the Chateau de Caix on the banks of the River Lot, 20 kilometres from Cahors in France, where he produces about 150,000 bottles of red, rose and chardonnay every year. He is one of an increasing number of French winemakers who are elbowing Australian wines off Australian shelves. Customers have embraced the imported labels, with the Dan Murphy's chain seeing a 65 per cent jump in the sale of imported wines over the past year. There is some law in the tabloid world that a fairytale story can't be a fairytale forever. In a way that is understandable. No one's life stays a fairytale forever, if it is ever one in the first place, regardless of whether they are royal, rich or 'ordinary' (no one really is though are they?). No matter what a life looks like from the outside, there are always real life issues and relationships to deal with. The Australian women's magazines have in turns had positive stories about Mary and what might be kindly called made-up, trawled from online royalty forums, and sometimes stories are a little more than made up and are a kind of toxic fabrication. Tabloids are in business to make money and editors of Australian magazines know they sell more magazines when Mary is on the cover. It doesn't seem to matter to them whether it is truthful or not. The Danish royal court would not comment on such confections, so they are free to write whatever. It is the same with the lower end Danish tabloids too. This week is one of those weeks when fabrication has taken precendence over the facts. It is unhappy reading when the facts are so contrary to the rubbish the Australian magazines choose to publish. These magazines do no journalistic investigations of their own (unlike Billed Bladet in Denmark) but appear to read online sites and make up some twisted version of what they read there. It is disappointing to read these baseless stories and think that some of their readers may believe them. Princess Mary has hit an all-time low following a barrage of criticism for sending Prince Christian to school so young. Eyebrows were raised over Mary's controversial enrolment of her 17-month-old son, with cruel critics accusing the Princess of abandoning her son and not being able to cope with the demands of being a stay-at-home mum. Insiders say the Princess burst into tears after learning of the backlash, especially as it hadn't even been her decision to enrol Christian. "Mary basically had no choice," explains a palace insider, who says it was pressure to conform to Danish Royal protocol that forced the move. "Princes Nikolai and Felix did it," the insider adds. "It's normal in Danish society." There are so many errors, fabrications and internal inconsistencies in the story it is hard to know where to start. Where is the controversy? Not in Denmark, and in Australia? only in Woman's Day. How do we know about Mary making tearful phone calls? We don't. Frederik has been in Denmark, 'at home', since his return from the Galathea 3 Expedition on March 11 and has done a number of official duties in that time (photographic evidence and reports are here on this blog, plus he has also had an audience at Christiansborg in place of the Queen). Mary is not a stay-at-home mum, she is a working mother and has commented on this in the past. It isn't work as most of us know it, but it is her work. Lonely and isolated? Where is the evidence? There is none. It is a real pity the Australian magazines cannot lift their game and work out a better way to report on Mary's life and activities to more accurately reflect what really happens and also reflect the kind of stories most readers would like to see about Mary. In contrast, this week New Idea has had the good sense to just report it as it was. They reported on Christian in their online blog and there is no story in the hard copy of the magazine. PRINCE Christian, second in line to the Danish throne, has completed his first day at a public nursery school. Dressed in a duffle coat and met by dozens of photographers, the 17-month-old prince arrived with his parents, Crown Prince Frederik and Australian-born Crown Princess Mary. After being greeted by the nursery school staff of The Queen Louise Kindergarten, in Fredensborg, north of Copenhagen, the family paused briefly for photographers before entering the building. The royal couple chose the non-private school near their Fredensborg Castle home just north of Copenhagen. Christian was born on October 15, 2005 and his mother, Princess Mary, is due to give birth to a second child in May. Another example of strange journalistic standards are the captions in this News.com photo gallery - nice photos, but Frederik and Mary stayed with Christian the whole time he was at the nursery (for two hours) and did not leave him there. Why is it so hard to get the basic information right? It makes you wonder about fact checking in the more serious side of journalism.